30 Day Personal Challege failed. I wasn't able to continuously craft for 30 days. I'm very disappointed in that. I was able to complete 14 days of crafting. I made some great projects and learned a few things. I haven't been totally inactive, but the amount of time I have had this last week has been minimal. I'm going to attempt more time in my craft room. I just don't think life will allow me to be in it every day. I hope you will still check in and see what I am up to! Day 14 of 30 day challenge. For day 14 I wanted to do something I have never done before. A scrapbook page! 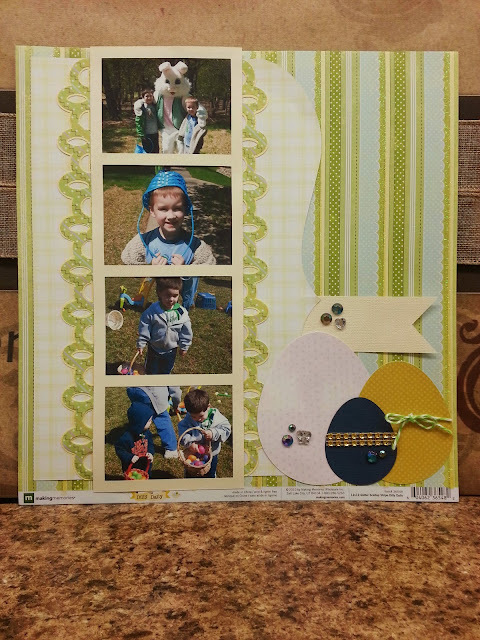 I found an easy layout at SVG Cuts, in the Poplar Street Tulips collection. My pictures were going the wrong direction, so I turned things around to make it work for me. I like it! It was easy and quick to do! The larger pattern paper was from making memories called dilly daly. I got it on clearance a few years ago and I'm trying to use it up. The rest was scraps or AC cardstock. Had it all complete in under an hour. I may just do some more in the future! Days 12, and 13 of my 30 day challenge. Sorry! I'm running behind on my blog posts. But I have been in my craft room creating! I'm a little hooked on these word albums. There are so many possibilities! Personal names, sports, teams, cities, events! What a lot of fun. The first two I did were at the requests of others. 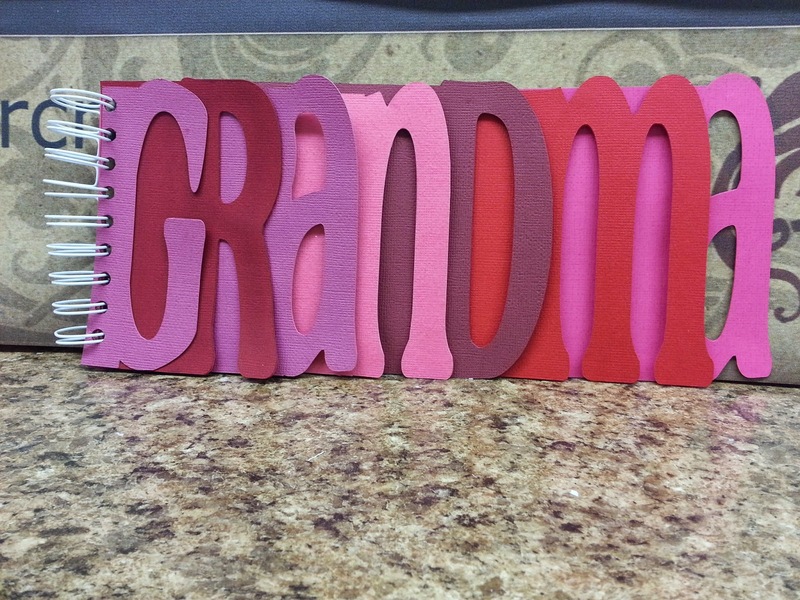 I did the grandma album first, then had a request for a name. The name album came out so adorable. I used papers from DCWV Nina's kids and Kidlet collections. Then I wanted to do one for myself and actually add embellishments. So I picked my granddaughter Cora and made my own album. This one I did for myself! So much fun to add pictures and stickers! I have seen some really tricked out albums on Pinterest and google. I'm not that creative! A simple word with adorable paper and a few stickers and I'll call it good! Both of these were made by cutting each page two times. One cut facing correctly and the other a mirror image. I then glued the two pages together. That takes skill! Lining up the edges before the clue dries is a little tricky! I used a plastic scraper I keep on my craft counter to spread the sheets together as flat as I can. Otherwise you can kind of see the glue stripes. I also put a paper towel over the letters while I did my flattening, so I didn't damage the letters. I have a few crafting tools that I don't get out very often. The Cinch is one. I can see myselft using it more often now that I have the hang of making word albums. You could make some really cute holiday gifts too. I can see them being used as recipes books, using the word recipes or cookies, or breads, and then having a different recipe on each page. 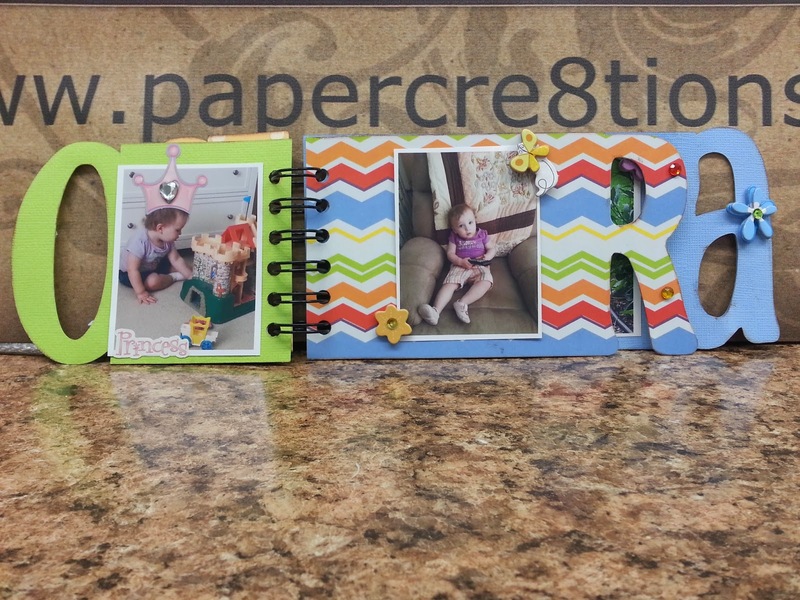 Or using numbers to create cute little year books highlighting some very important moments. The possibilities are truly endless! I spent day 11 watching a video tutorial and then designing a word mini album. Below is a picture of my prototype. I downloaded the free font Cafe Rojo for the letters. Watched a video by Krafting Kelly. She uses the Silhouette Studio software, but I found it to be very similar to ecal 2. Then made my own cut files. 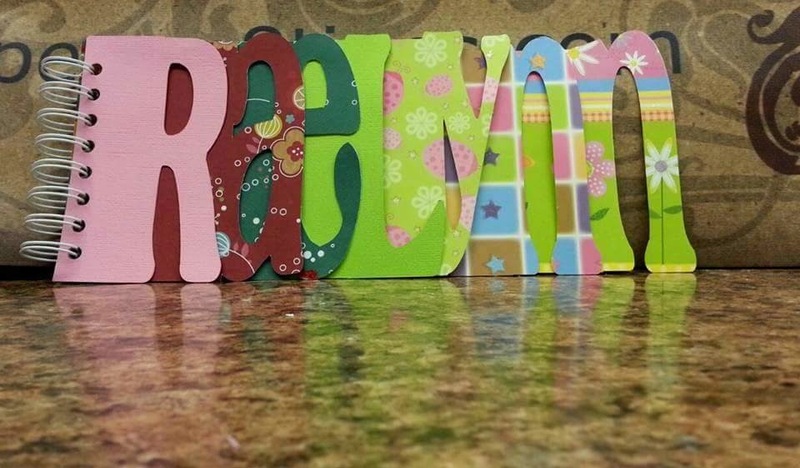 I cut each letter out two times using AC cardstock. I tried to use some chipboard I have, but it was way to thick. I then used my Cinch to punch the holes and put in the wire binding ring. Now it's ready to be decorated with pictures, sentiments and pretty embellishments. And, I have learned a new and very useful skill today! Which is what I was hoping to do during my 30 day challenge! Thanks for stopping by and be sure to drop by again! Today did not get the results I hoped for. I was trying to do a scrapbook layout, but my computer and printer would not communicate. After two hours getting pictures to print, my crafting time was over. I hope to finish the layout and design a word album tomorrow. Be sure to check on my progress! 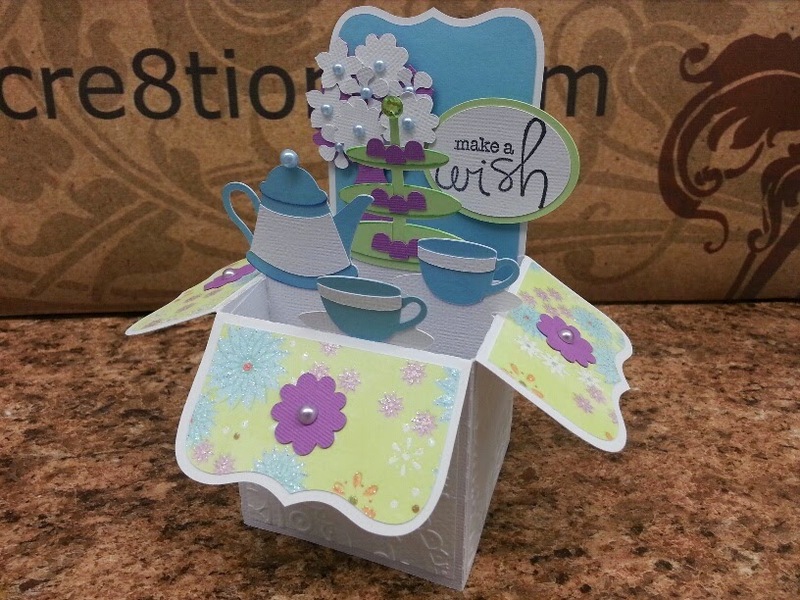 Day nine saw the successful completion of the teapot from SVG Cuts Tea for You and Me kit. This was a great project to do. I love how well it went together! It looks so real and is so sturdy. 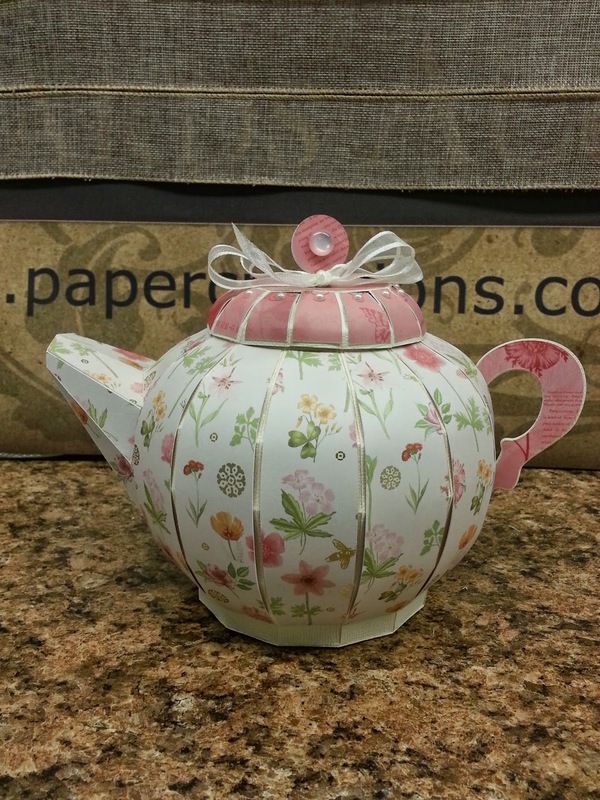 This teapot will be part of my Facebook 200 page likes give away. I will be making the entire kit for the lucky winner! For the base I used AC cardstock. For the panels I used DCWV's The Butterfly Garden stack. It has a real English teapot feel to it. 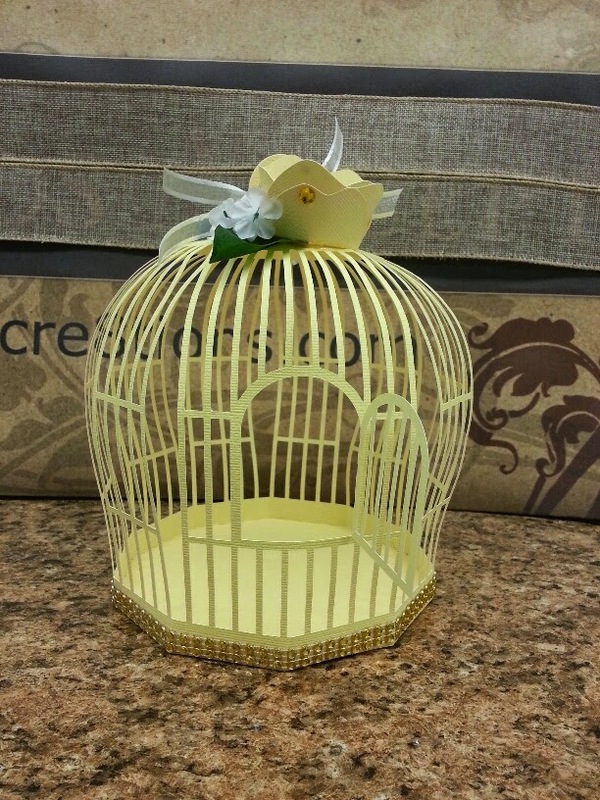 I added some little sticky pearls on the lid and lid handle, and tied a ribbon to affix to the top. It's going to be hard to let it go! Once again, thank you for stopping by my blog. Be sure to check in again for more crafting adventures! Day 8 was a personal challenge! It has really been a challenge these last few days to get into my craft studio, but I have managed! I have a teapot cut out and ready to assemble, but I got a request for a baseball cap for a high school prom. Prom wins! Here is what I put together. It will carry the boutonniere for a prom date! How exciting! This is the baseball cap from Fun and Games by SVG Cuts. I used AC Cardstock for the entire project. 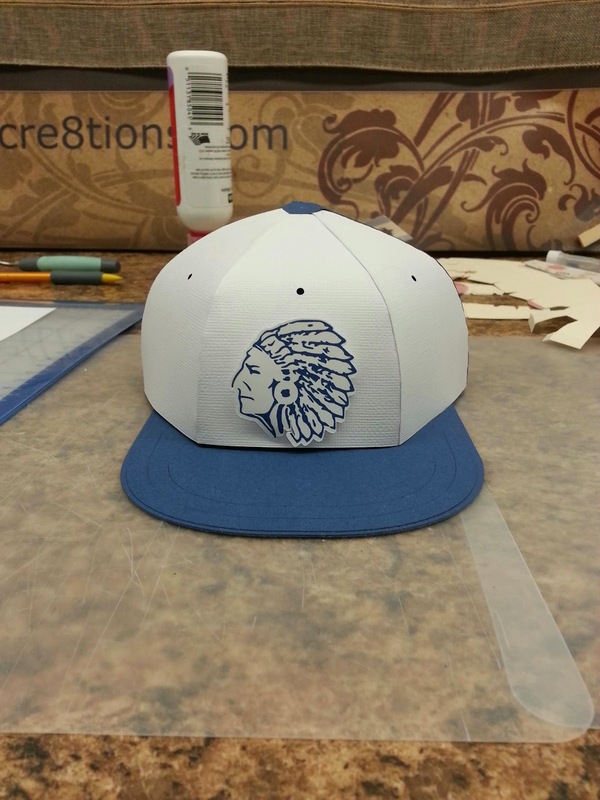 I did a print2cut for the indian head logo from the school. 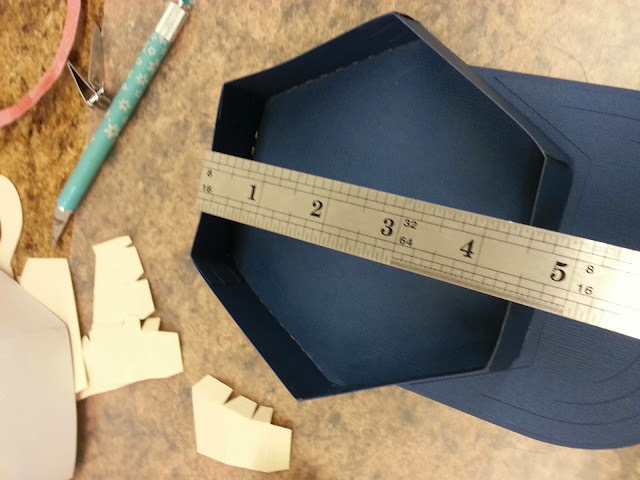 If you haven't made the cap for yourself, it is very roomy. Thanks again for stopping by. Be sure to check in tomorrow for the finished teapot! First, let me start today's blog with a customer service story. Yesterday's project didn't turn out the way I had invisioned, and I want to make another cap, correctly. One of the problems I encoutered was the shape I wanted to cut didn't maintain the score lines when I broke it apart and copied it to a different page. This is something that is really easy to do, if you know what you're doing. Clearly, yesterday I did not. I had to hand score the tabs for the front panels. I don't enjoy scoring by hand. I knew that what I wanted to do could be done, I just didn't know how to go about it. So, I sent an email to SVG Cuts. They are the designers of the file I was using. Within 2 hours I had a response and a link to the video I needed. 2 hours! That's just the kind of service you can always expect from SVG Cuts. Be sure to check back tomorrow to see what it is! Well, today's project didn't turn out exactly as I had planned. I'm a visual person. So I don't alway get the end result I want, until I see what I have done wrong. The baseball cap from Fun and Games by SVG Cuts, was going to be fashioned after the WSU Shocker mens baseball caps. Gold on the front and black on the back and bill. For some reason, I could only see (in my mind) that two front panels needed to be gold. Nope, needed to be three. Oops. I went ahead and cut a third gold panel and glued it on over the back. I can't give this one away. I'll have to keep it as a reminder that I need to cut three different panels. It doesn't look terrible. But it's not right. I didn't measure the area for the logo very well either. This one is a little too big! So, today's crafting was a learning experience! I used AC Cardstock for this entire project. I also did an internet search for the team logo and did a trace into ecal2. I did some tracing in the original ecal, but I like what ecal2 does, so much better. I don't usually have to do much to the image to make it cutable! Thanks for stopping by and be sure to stop in again soon! 30 Day Challenge, Day 5 Happy Easter! Today's post are projects I actually made last night in anticipation of not having time to craft today. 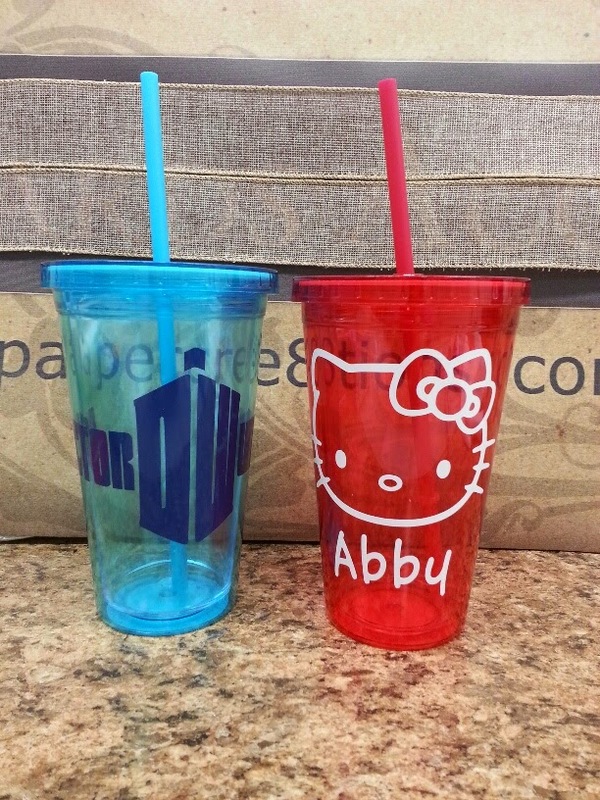 I used my Sizzix eclips2 to cut vinyl for these two tumblers that are bithday gifts later this week. Both vinyls are oracal 651 that I purchased off ebay two years ago. I was afraid to use it until now! After watching a few youtube videos on how to apply it I have been less hesitant. 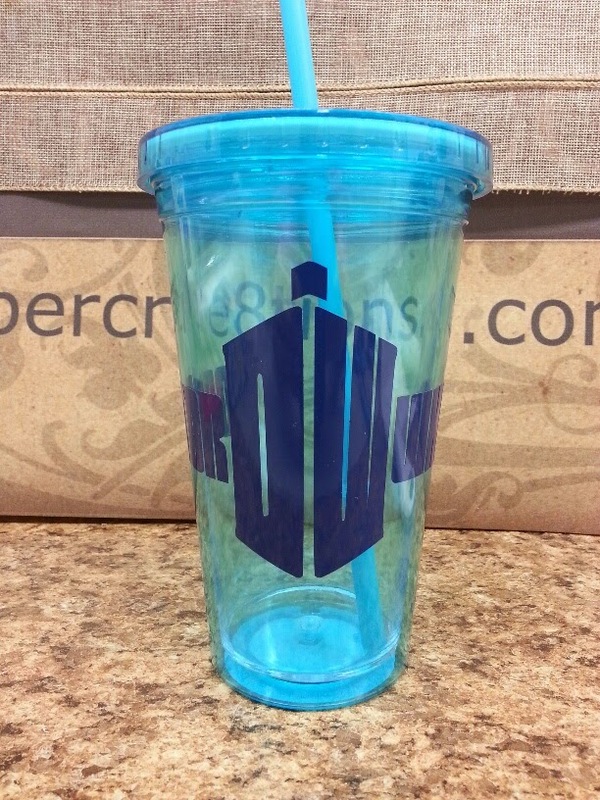 I'm very pleased with the outcome of these tumblers. 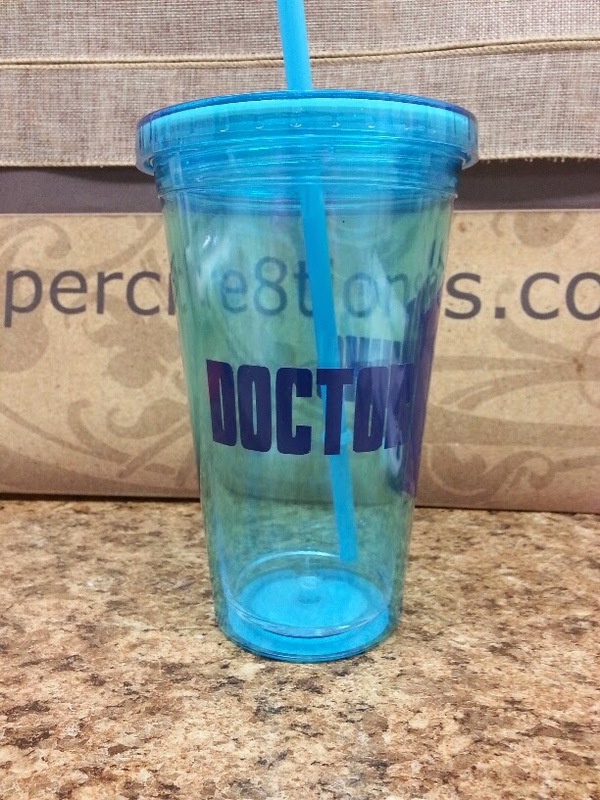 I bought a case of double wall tumblers from Dollar Tree. This case had the summer colors. It has the red and blue you see and a really nice green and orange. I found the images on the internet under free svg searches and then did a trace into ecal2. I love the wrapper feature! 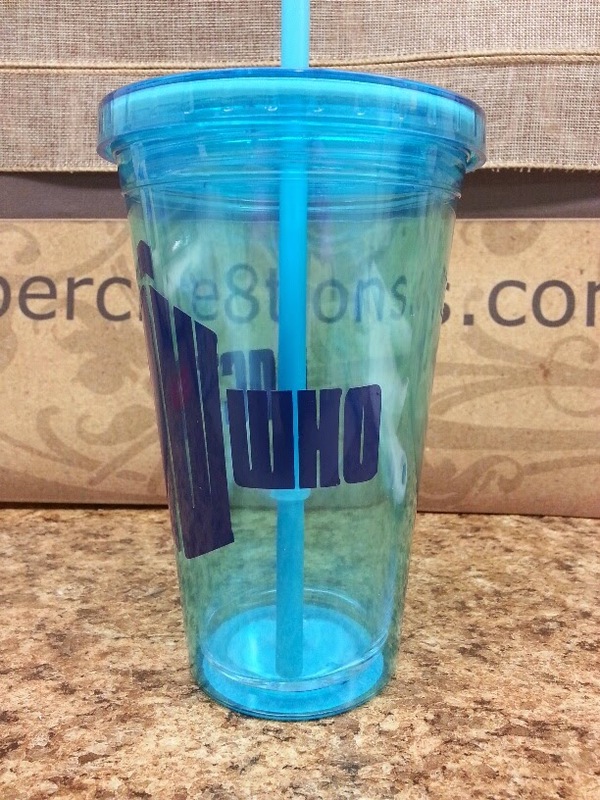 It curves the words and design so your cup looks more professional. I have found for transferring the design from the mat to the project is really easy with some Dollar Tree Clear Magic Cover. It's clear shelf paper that has just the right amount of sticky to make the transfer and you can see what you're doing. Thanks for stopping by and be sure to check out my facebook page. I will be having a spring theme give away because we got to 200 page likes! WARNING! This one hits high on the cute scale! 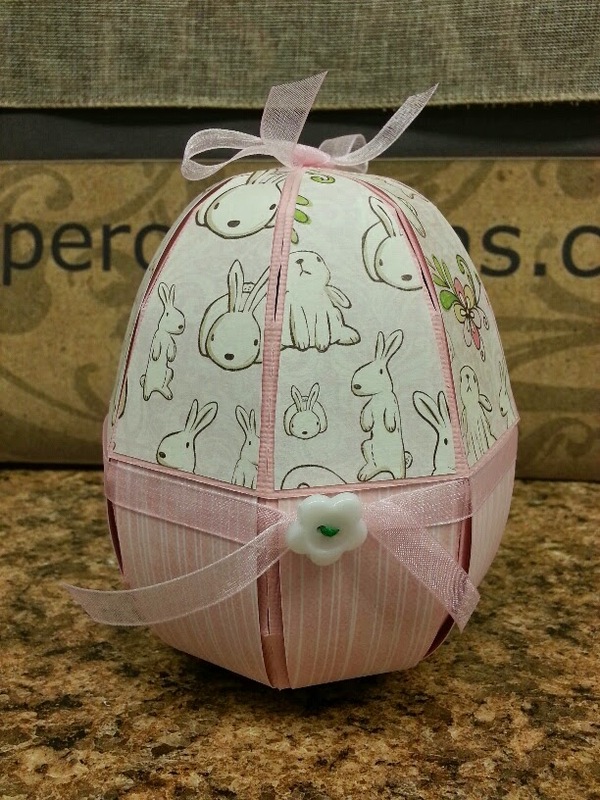 This egg from the Poplar Street Tulips by SVG Cuts is a favorite. It always looks so good when it's finished! 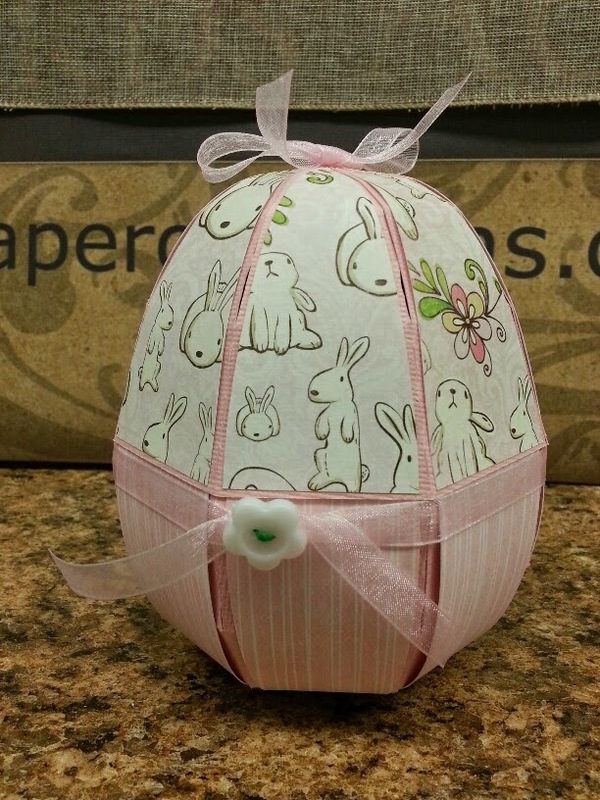 This egg turned out too darn adorable! The base is pink AC Cardstock. The top panels are by We R Memory Keepers, Cotton Tails. I got several sheets at Hobby Lobby in a clearance pack. Love it! The bottom panels are from First Edition Papers. The collection is called Spring Drop. I'm going to be looking for that stack again. It is sooooo cute. This egg is a hostess gift. I was hesitant at first about the pink makng a statement, but I really do love how it turned out! I think it will be well recieved! Tomorrow I will have a post, but I made the project a day early. Hope you don't mind! Thanks for stopping by. Be sure to visit my facebook page and give me a like! I used AC Carstock for the entire project. 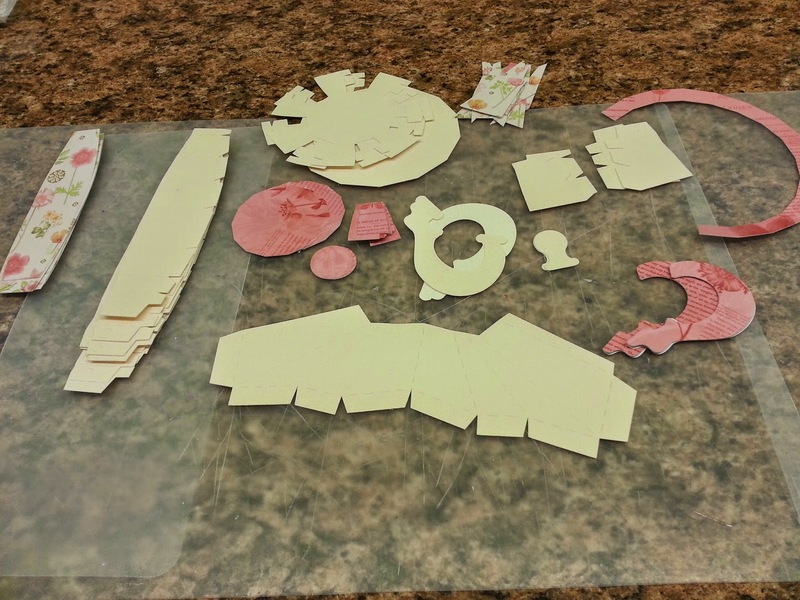 The pieces cut out beautifully on my Sizzix eclips2. I think this will be something I actually keep on a shelf in my livingroom. My next project will have to be Easter related. 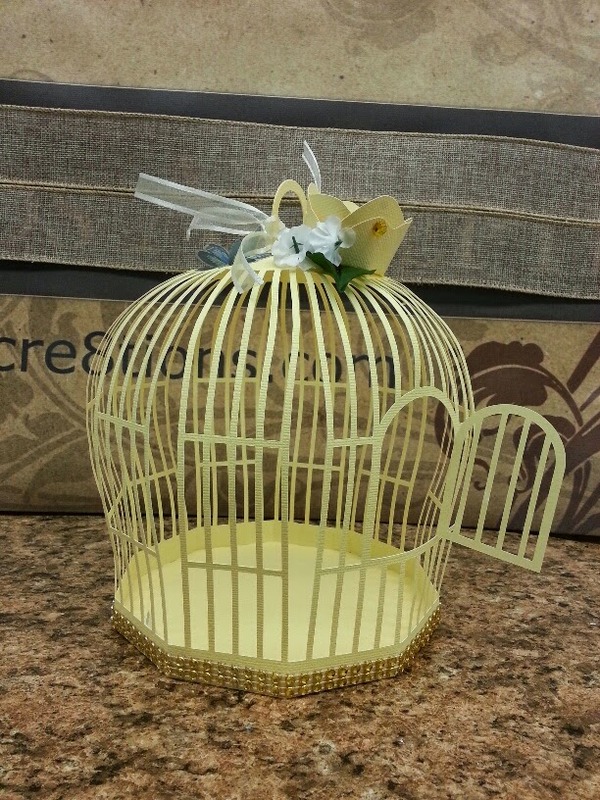 I want to make a hostess gift for a egg hunt party that a family member is having. I will also have a post on Easter Sunday, but it will actually be a project I make today or tomorrw. I'm hosting Easter dinner and doubt that crafting will be something I can do til very late on Sunday. I'm just 3 page likes away from reaching 200 on Facebook! I'll be having a spring theme give away when that magic number is achieved! It is day 2 and I do have another project to share. Today it's from the SVG Cuts Box Cards file. 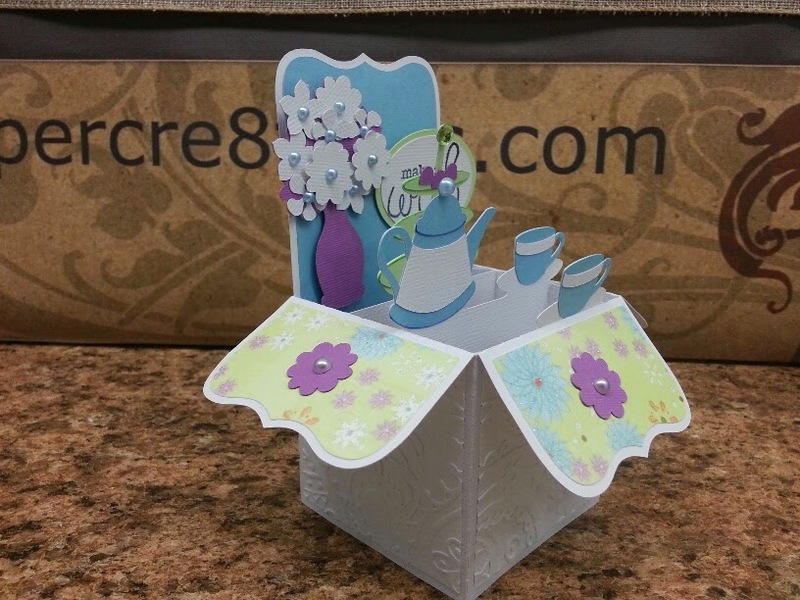 To make this card I used one full sheet of white AC Cardstock and the the rest of the single colored paper was from scraps. The fun flower paper that is on the inside flaps is from First Edition Paper. The pad is called Spring Drop. It is full of bright happy cardstock! 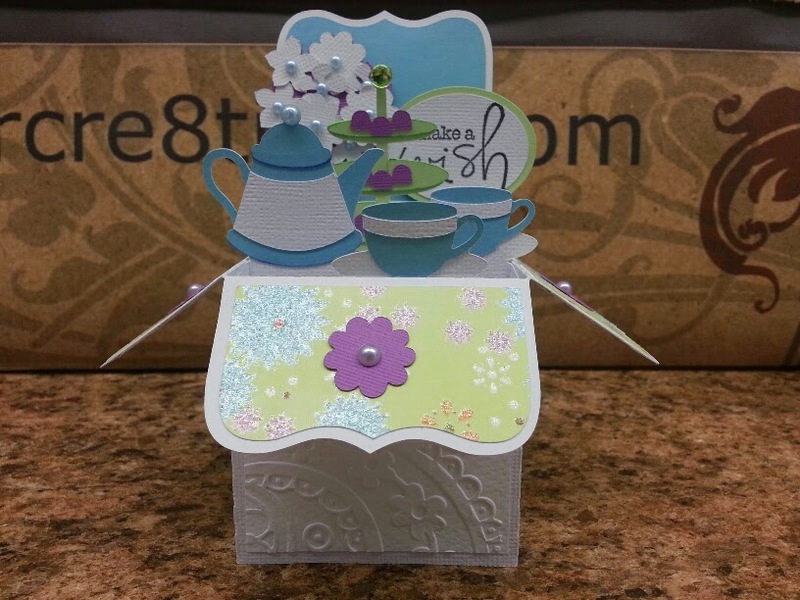 I used two different embossing folders for the outside panels. Making this card was a double challenge for me. I don't really care for "fussy" projects that force me to make a lot of decisions about what papers to use. I buy the majority of my paper in 12x12 format, so when I have to cut an entire sheet for a small project, it causes me great grief. I thought I would branch out and buy some 6x6 pads for box cards, but the pads I got didn't fit this card. However, I did find this card to be delightful and fun. I'll make another box card before the month is over! 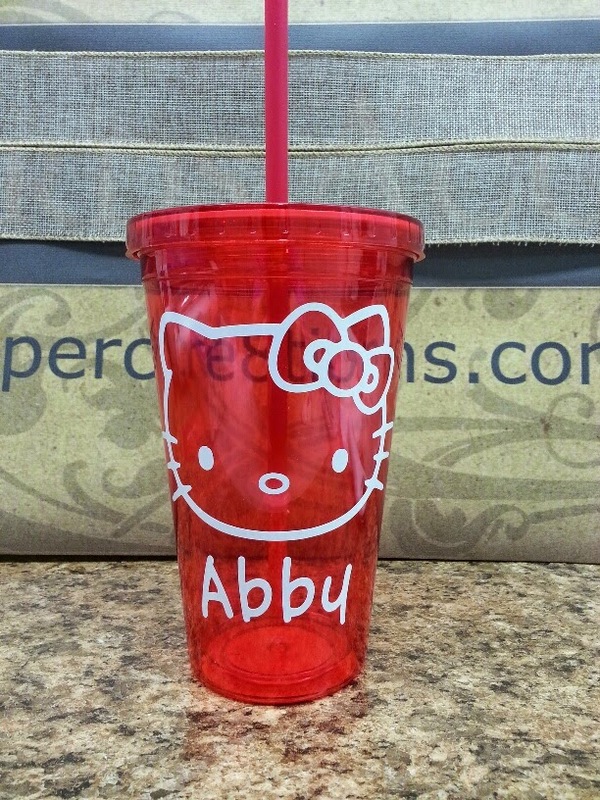 Still trying to get to 200 facebook likes for a spring theme give away. Will you help? Thanks for stopping by and be sure to check in again tomorrow! Day 1 of the 30 Day Personal Challenge! 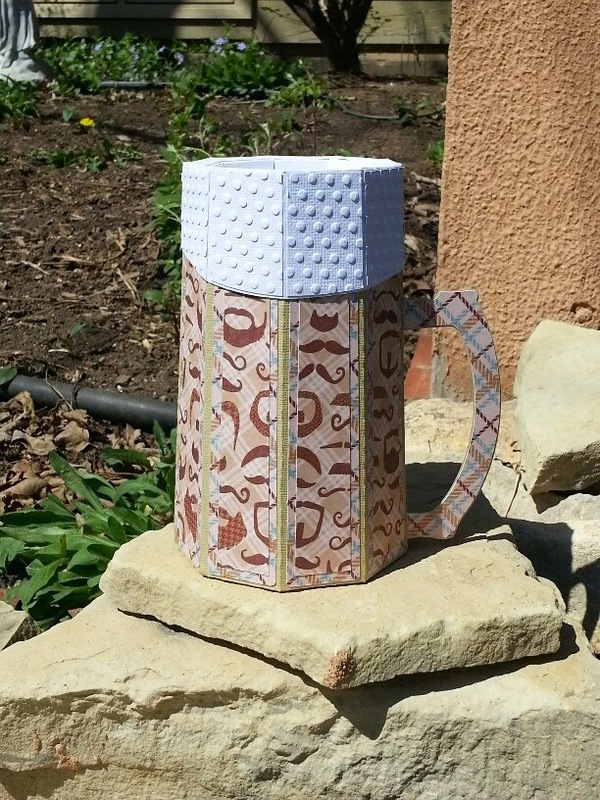 For my first day of the 30 day personal challenge I have completed the beer mug from the Feeling Lucky kit by SVG Cuts. This was suprisingly easy and very fast to put together! Another one for my favorites list! To put this together I used AC Cardstock for the base and The Guy Stack by DCWV for the panels. I embossed the white panels with a Cricut Cuddlebug folder I've had for a long time. (I will be on the lookout for a more sudsy one though!) This is a great example of how versitile the kits are at SVG Cuts. As I continue my challenge, I will use it as an opportunity to stockpile some gifts and cards that I will need in the very near future. I'm terrible about starting on projects at the very last minute, or not getting them started at all. I hope this challenge will help me do a better job of planning and executing! While you're here, be sure to stop by my Facebook page and give it a like! When I get 200 page likes, I'll have a spring theme give away! Thanks for stopping by. 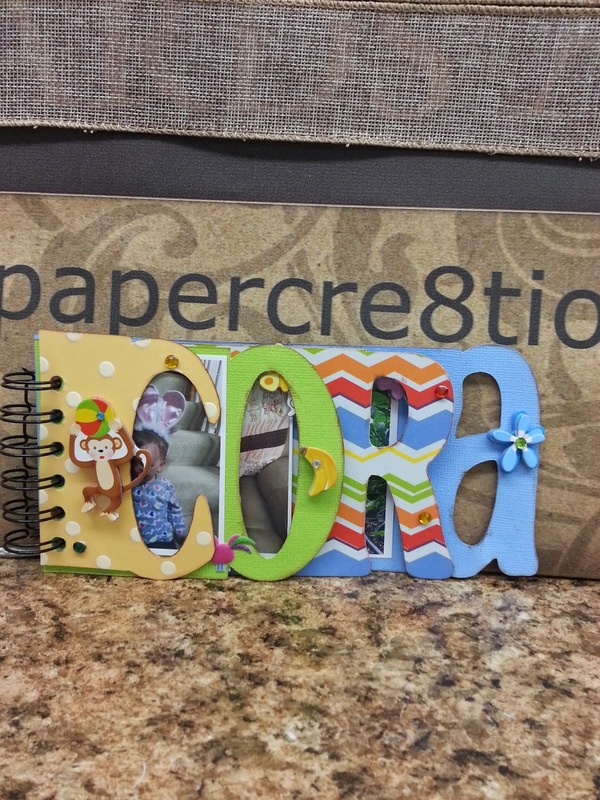 Be sure to stop by often (or daily) and see what else I have going on in the craft studio!